Jimmy Rix's latest work is on its way to Western Australia for the 11th Sculpture by the Sea exhibition at Cottesloe Beach. Seventy sculptors from Australia and Overseas will exhibit their work. 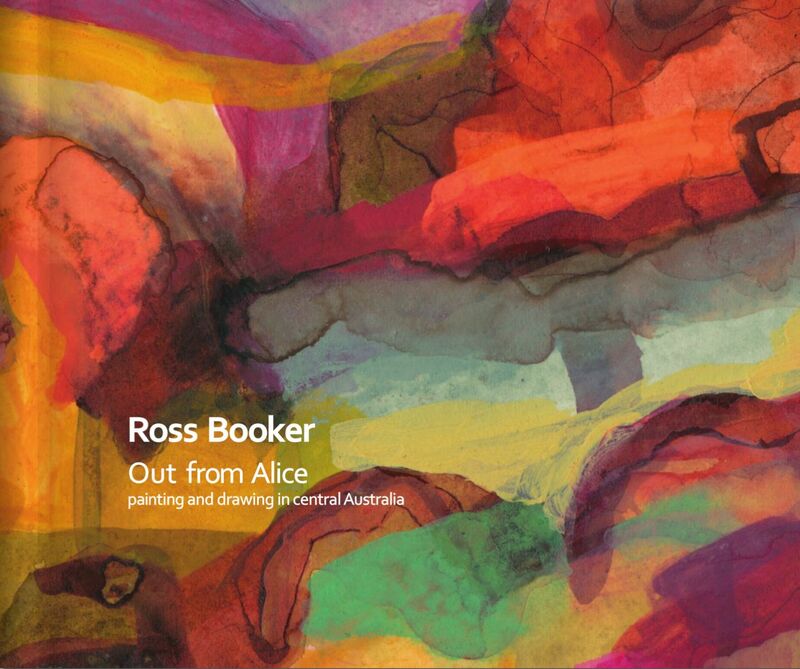 This is the third time Rix has been selected to send his work to Cottesloe for this event. 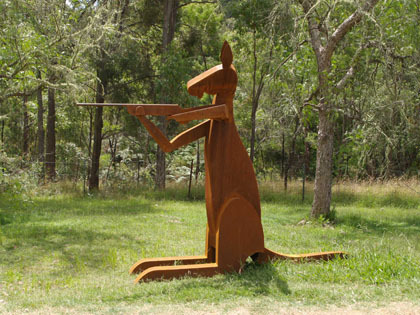 This year Rix's work Roo Shooter will be sure to entertain the 200,000 visitors to this event. Sculpture by the Sea, Cottesloe will run from 6th to 23rd March. 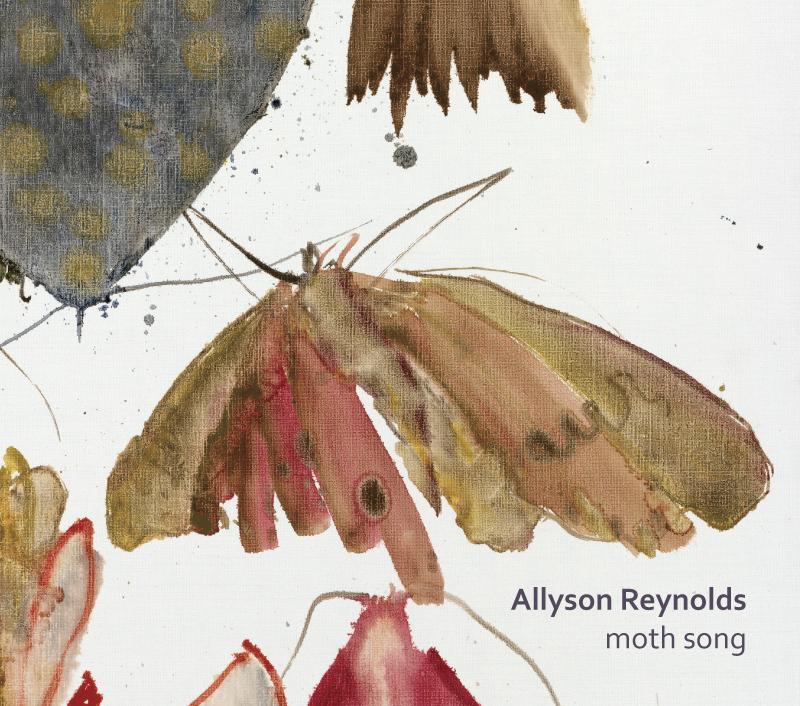 Adrienne Williams is one of two Wide Bay artists chosen to undertake an Artist in Residence opportunity in New Mexico, USA, later this year. The residency is part of the larger project Wide Bay High Desert II where 6 Wide Bay artists and 6 New Mexican artists will exhibit artworks in each other’s regions and spend the year sharing their techniques and work practices on a communal Blog. 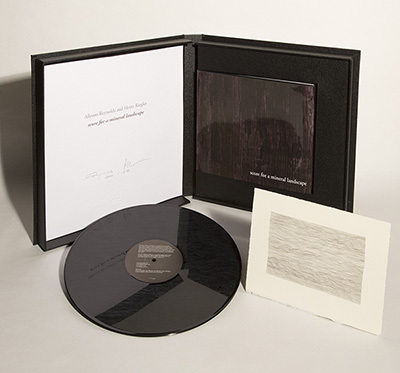 Helen Malone's artist book Back to the Front, made in an edition of four, will be displayed at four venues in the coming months. 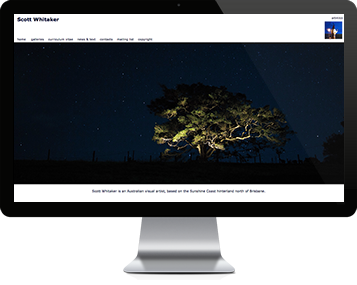 It will be included in the exhibition Between the Sheets at Gallery Central, 12 Aberdeen Street, Perth, WA from 7 March to 2 April 2015. The winner will be announced on 5 May 2015. 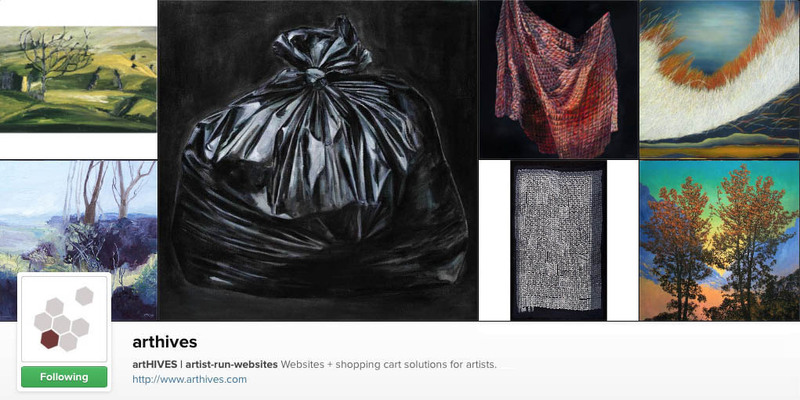 Already have an artHIVES website? now worries - if you win will will extend your subscription by 2 years. Not an artist? 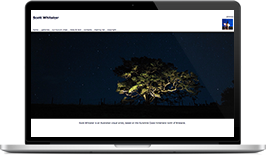 you can gift your subscription to an artist you know - you'll still get a great daily dose of wonderful images from artHIVES artists. *you know the deal - not transferrable for cash. 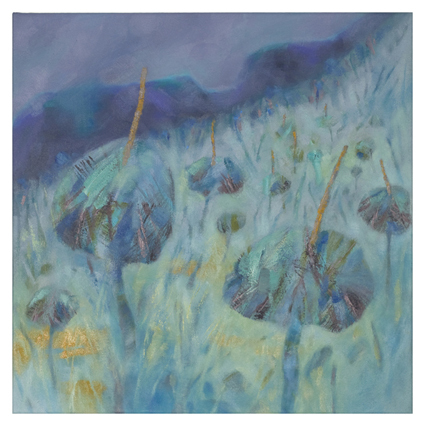 Fiona Kennedy Altoft has recently moved to Hong Kong to take on the Head of Art at an International School there. Originally she was going to of as an Artist-in-Residence but the school loved the fact she was a practicing artist and teacher. It has seen some exciting changes in her outlook on her work. 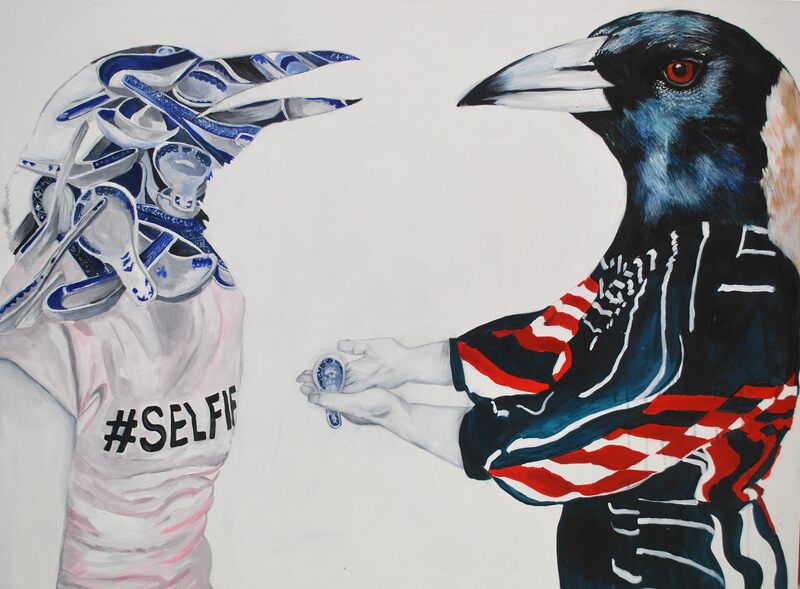 It has been an easy transition for her work continuing with her hybrid birds as her subject matter, her work soon turned to themes of migration and small elements have indicated her move overseas. 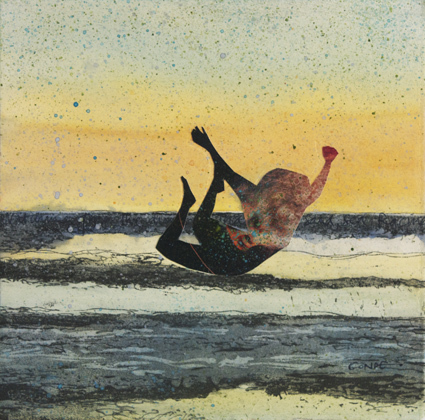 Jen Conde's WaveJumper paintings have been included in WATER, an exhibition curated by Debbie Mackinnon and Julia Roberts which is part of Art Month Sydney. The exhibition is spread over two venues in St Leonards, Sydney, me artspace, (25 Atchison Street) and T1 Art Terminal (9 - 11 Atchison St). 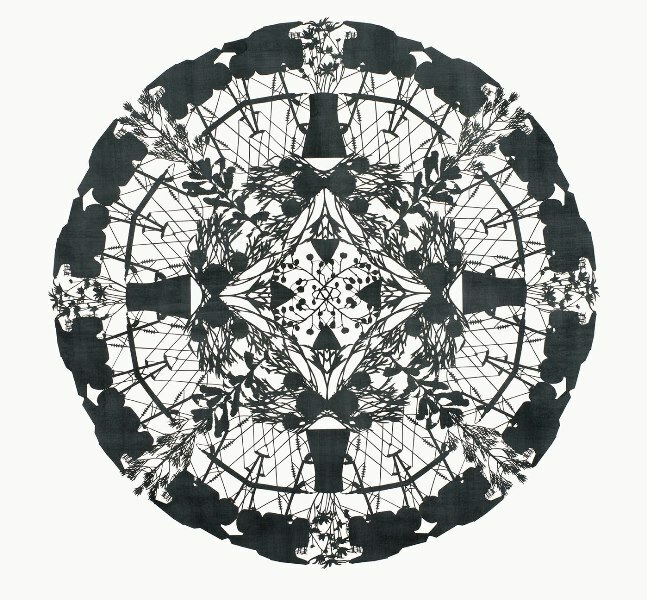 Nicola Moss' hand cut paper works are on show in Scientia, a group exhibition presented by Art Est. Gallery in conjunction with Art Month Sydney and LOST (Leichhardt Open Studio Trail). Curated by Lisa Woolfe, Scientia features seven artists whose work is informed by one or more of 'the Sciences' - including James Blackwell, Claude Jones, Laura Jade Hindes, Rachael McCallum, Nicola Moss, Meaghan Potter, Jane Theau. 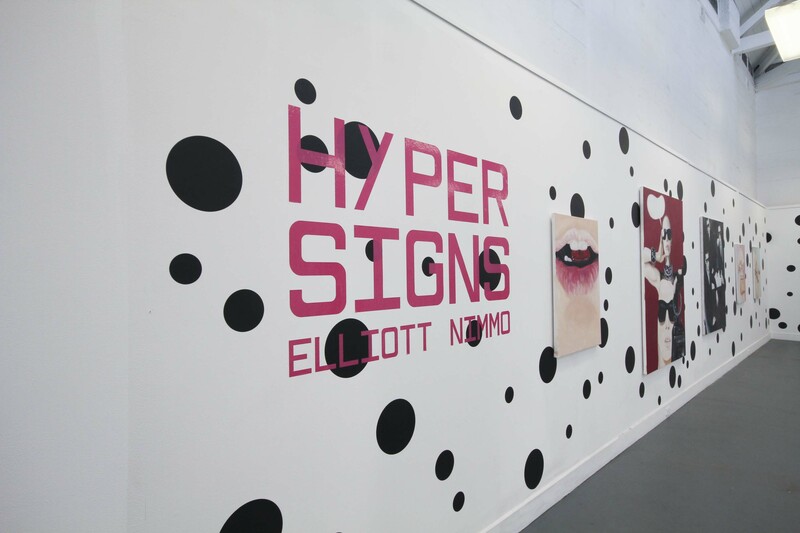 Sydney artist Elliott Nimmo exhibited his solo exhibition, HyperSigns, at the National Art School this February. The body of work, developed over the course of his MFA, is an exploration into advertising and fashion imagery as a subject for painting. 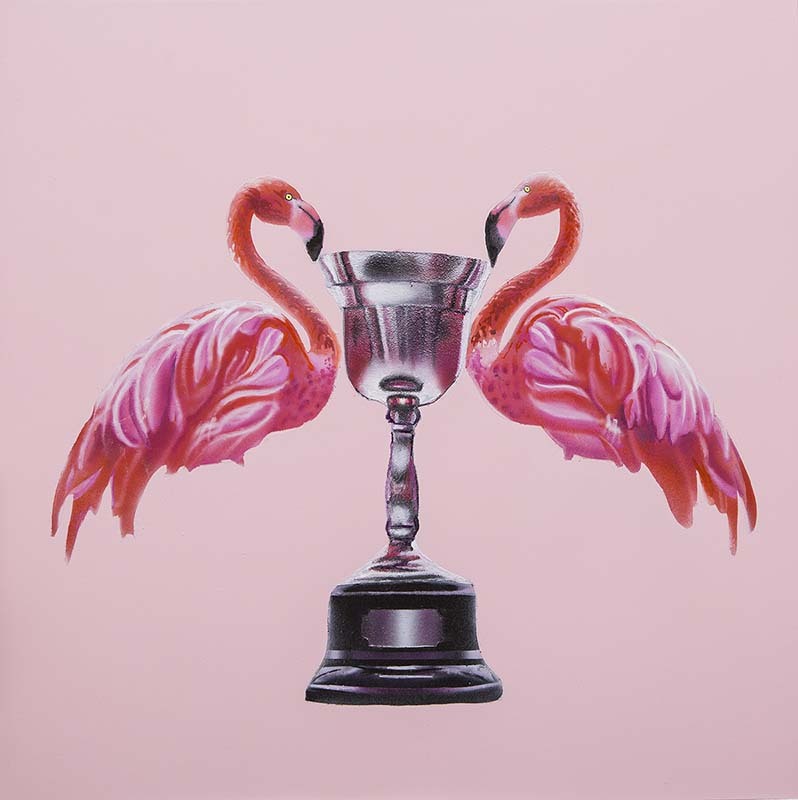 David Hayes will be represented by The Gallery Eumundi at the spring edition of the Asia Contemporary Art Show Hong Kong 2015 along with work by David Hinchliffe, Di West, Rhonda Cao, Wesley Denic and Rowley Drysdale. 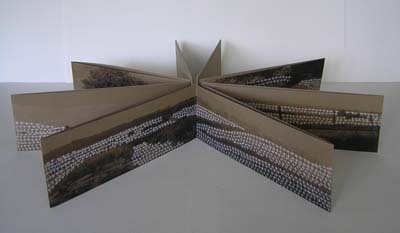 Susan Buret's installation Axis will be exhibited in the Mercury Gallery, Wollongong Art Gallery from 28 February until 10 May with the official opening on Friday 6 March 2015. Pattern has the ability to dazzle, delight, welcome, make cultural claim, give human scale end act as a navigating tool in space. 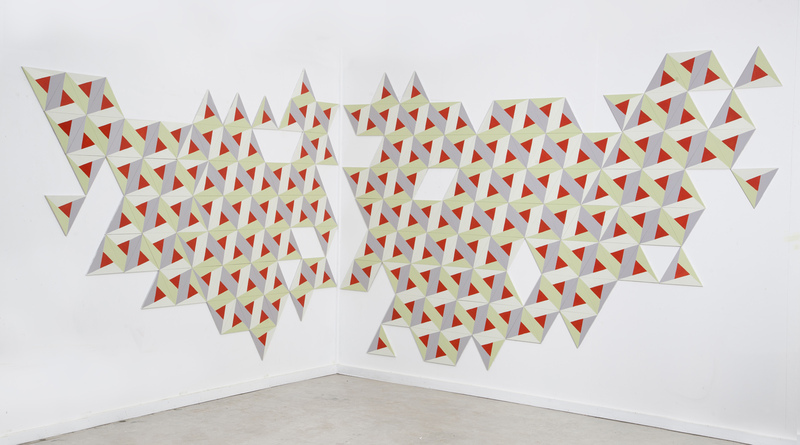 Extending the picture plane to include wall and floor, Buret uses painted tessellated triangular, ply working with colour, form and fragmentation to explore some of these characteristics. 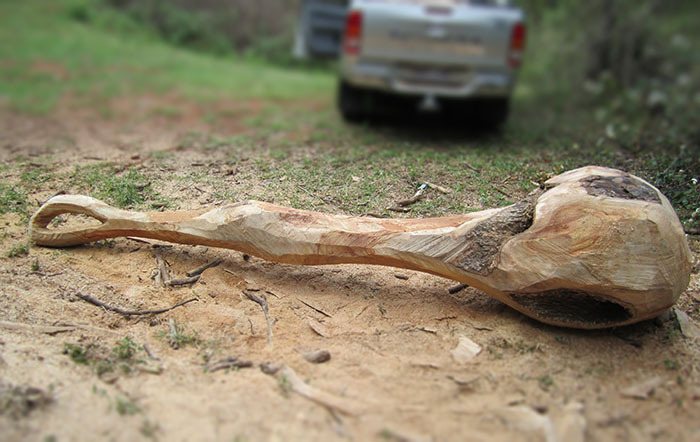 Stephen Newton’s large scale wood and stone sculpture are inspired by material and place and informed by nature. His work is included in con/struct: Celebrating Queensland Sculpture which features eleven artists that represent the scope and depth of contemporary sculpture across Queensland and who have a sustained practice working in the sculptural realm. AJ Taylor is exhibiting alongside Tim Maguire and Neil Frazer in Botanica which opens Thursday 5 February at Martin Browne Contemporary in Sydney. 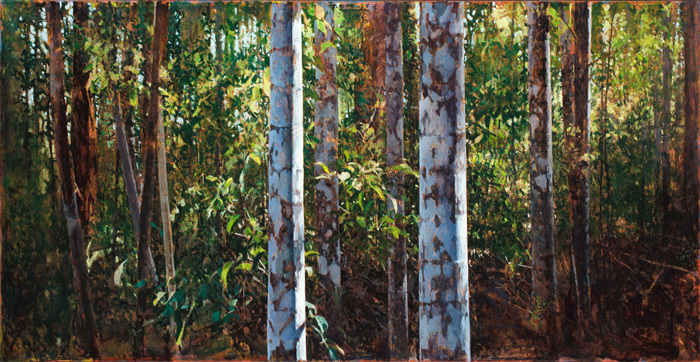 Taylor has contributed ten new works to the exhibition, including three large rainforest paintings continuing his popular and highly acclaimed Paynter Creek series as well as five smaller landscapes of Wild Horse Mountain near the Glasshouse Mountains on Queensland's Sunshine Coast.